Hamburgers do not have ham. English muffins are not. Strangely, an alarm goes off when it is on. Language can be very misleading indeed. As a convert, I noticed that Catholicism has added to this list a good bit! The priest absolved my sins in confession. 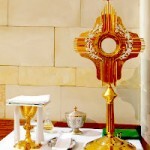 Father Joe confected the Eucharist at Mass. They were married on Saturday by Father Paul. 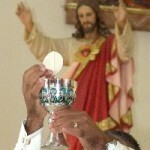 Strictly speaking, it is not the priest who absolves your sins or who confects the Eucharist. He does not have the power, but he does stand-in for Christ who most certainly does. 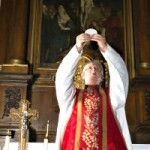 By virtue of Holy Orders, passed in an unbroken chain directly from Christ Himself (apostolic succession), priests are uniquely configured to the one High Priest. It is Jesus who, in these examples, absolves our sins and transubstantiates ordinary bread and wine into His Body and most Precious Blood. “Stand-in” is not the best way to describe the priest’s role. More precisely we say that he is acting in the person of Christ (in persona Christi). He is, to put it another way, acting sacramentally for Christ (“another Christ” or alter Christus) from whom sanctifying grace is conferred. It is Christ and His power at work, through His ministerial priesthood (we are all in His common priesthood via our baptisms). The distinction is important. Consider a confession where the penitent knowingly omits a mortal sin (a/k/a a “bad confession”). The priest, if given no reason to suspect this, will say the words of absolution. Never-the-less, the sins are NOT absolved and the penitent remains in a state of mortal sin. Priests can be deceived, Christ can not. The priest acts for, not in replacement of, Christ. May our Lord Jesus Christ absolve you; and by His authority I absolve you from every bond of excommunication (suspension) and interdict, so far as my power allows and your needs require. [making the Sign of the Cross:] Thereupon, I absolve you from your sins in the name of the Father, and of the Son, + and of the Holy Ghost. Amen. My third example (marriage) is a tricky one. In this case, the priest is not the minister of the sacrament – just a witness. It is the couple themselves who are the ministers… even if they are not Catholic. Barring impediments, every validly baptized man and woman enter into a sacramental marriage (whether they realize it or not). Back to my main point, when a non-Catholic says only Christ, no man, can forgive sins they are correct. It is Christ working in the confessional who absolves our sins, doing so through the ministerial priesthood He commissioned and ordained.